Located at 253 South West Street, the Mad River & NKP Railroad Society Museum is the largest railroad museum in the state of Ohio. Founded in 1972 and opened in 1976 as a community bicentennial project to honor Bellevue’s history as a rail center, the museum contains a growing collection of historical and educational railroad memorabilia and artifacts. 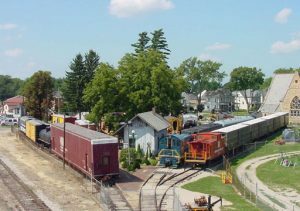 Visitors are encouraged to climb aboard the many vintage cars and locomotives including the first dome car built in the U.S., a Pennsylvania Railroad RPO car, and a Wabash F-7 locomotive. There is also a watchman’s tower, depot, L.S. & M.S. section house, and Trackside Gifts, the museum’s store.